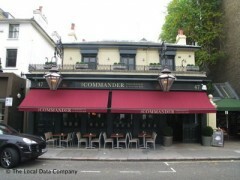 About: The Commander Bar is a contemporary eatery incorporating an oyster bar and bistro style restaurant. Offering an extensive menu of modern British cuisine and seafood, they pride themselves on their use of fresh produce and for their friendly yet unobtrusive service. The Commander Bar now also boasts The Vignette, a wine lounge and tasting venue for up to 14 people. This private dining venue provides intimate seating and a choice of over 100 varieties of wine. Who said oysters had to be expensive? At gastropub the Commander you can order them individually from the display counter for just £1.80 each, plus every Monday their rock oysters are a bargain £1 each. Transport in London is not worth getting agitated about - it is what it is – but sometimes, just sometimes, it all gets a little too much to bear. When a pub/restaurant can drain this sort of angst immediately on arrival, you know it’s doing something right. So to the Commander Bar, just shy of Ladbroke Grove, and in possession of a gift that aids recovery from TFL inflicted pain. A generous sized venue, it’s located on a quiet side street that matches the relative tranquility inside. Part pristine bar, part restaurant, the Commander Bar’s good looks are a big deal of its appeal. Shiny tiles, well placed pillars, a dark wooden bar and plenty of window booths if you don’t fancy the table cloths of the dining area. Ordering here is the first problem point we encounter – but order we do. This is a toned down sort of place and the atmosphere makes a good place for pairs. Deciding on the seared tuna sashimi for a starter was the simple choice and with its punchy soy and ginger it would make a match for even the greatest prawn cocktail, which is after all, the king of starters. Right? Dessert was converted and it is testament to the delicious strength of the chocolate and Amaretto sundae that the dish was left empty. Accompanied by a robust Malbec, there was nothing that could disappoint. Tuesday is steak night every week and for a sum of £16.00 one can enjoy a fine piece of meat accompanied by a glass of red wine. Ordering a la carte, a three-course meal for two with wine will amount to a reasonable £85 and at a venue with as much going for it as the Commander Bar, that’s not half bad.